In the spring of 1955, the Knights of Columbus erected 20-foot crucifix in Jordan Park, a public park in Gary, Indiana. On October 16, 1955, a second crucifix was dedicated in Wicker Park in nearby Hammond, Indiana. It wasn’t long before The Greater Hammond Ministerial Association voiced deep concern about infringement of the constitutional principle of the separation of church and state. 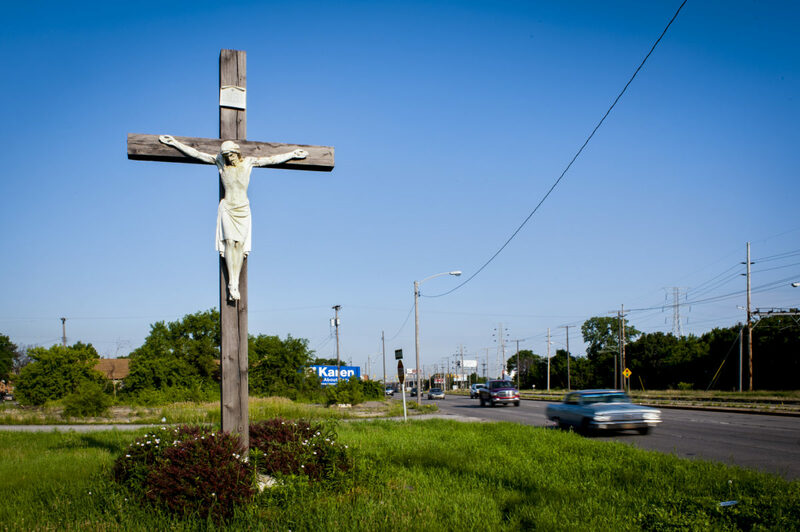 Opposition to the crucifix in Wicker Park resulted in the Indiana Civil Liberties Union (ICLU) in Northwest Indiana becoming involved in the controversy. In 1963, a lawsuit to remove the Wicker Park crucifix, filed in the Lake County District Court, was dismissed. In 1981, Mel Schlesinger, a local realtor raised the issue with the Calumet Chapter of the ICLU. In 1983, Schlesinger filed a lawsuit in the 7th Circuit Court in Chicago to have the Wicker Park crucifix removed. After year of inaction in court, and a petition drive by the churches, a judge ruled to allow the crucifix to remain the the park. An appeal was argued on March 29, 1993 and the court’s decision was reversed, ordering that the crucifix be removed immediately. Following the victory, the plaintiff’s attorney looked into the possibility of bringing a similar suit against the Gary crucifix, but was unable to find anyone willing to act as plaintiff. The Gary crucifix remains in Jordan Park.